Compak Sporting Clays or Compact Sporting Clays or Compak Clays or Compact Clays is basically the same game. Originally developed in Scotland in 1982 the game of Compact Sporting has now become a regulated game called Compak Clays. and controlled by the ISSF - International Shooting Sports Foundation. There are rules for Compak Sporting and these can be found on the ISSF website. Compact Sporting is an easy, proven, safe game that shooters love and are guaranteed to improve their shooting results. Compak Sporting is cheaper than regular sporting clays and you are sure to save money. Compak Sporting shooters will give free advise to new shooters. All names used to describe a similar game. BUT, where did it come from? Let's go back 25 years to Scotland in 1983 when I developed Supersport. The main feature of the game was that no one knew where the traps were hidden, or where the sensing wire wire loop was buried in the ground. The shooter walked a roughly defined circuit, say 10 - 15 yards wide, and would eventually cross over the buried copper wire. As the wire was buried in twists and turns and zig-zag patterns, he could not be sure of triggering the circuit at the same place each time. Look at the example to the right. 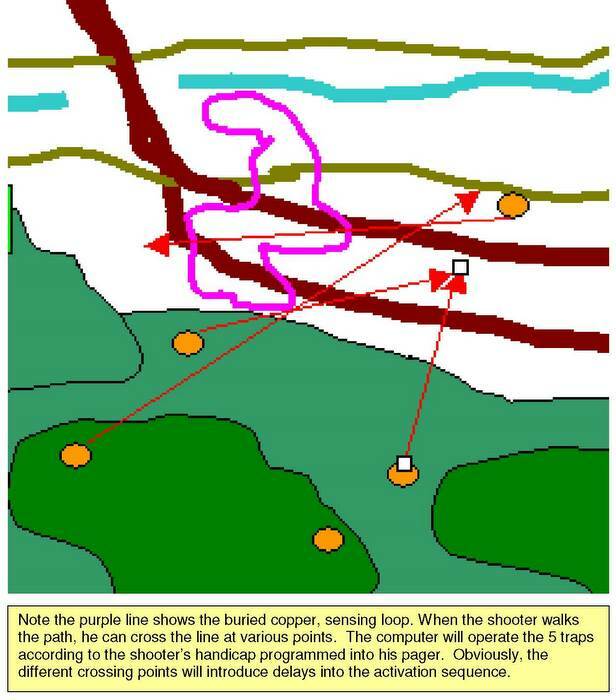 You see the purple wiggly loops, they are the buried wires, depending upon the route the shooter takes, he'll cross the line at different places. First, let's blow up the first sensing area (click on the red square). Next blow up the yellow box and see where Compact Sporting originated. Since 1984, The Shooting Academy has installed numerous Compact Sporting Clay games purely for the enjoyment of shooting multiple targets from a fixed position. Some called it "Lazy Man's Sporting Clays"
Over time I introduced the Compact Sporting Deck, where shooters could enjoy the sport from the shelter of the elements. The first "Grand Deck" was built at The Shooting Academy at Nemacolin Woodlands, PA. The Abu Dhabi International Shooting Club at Al Forsan International Sports Club. 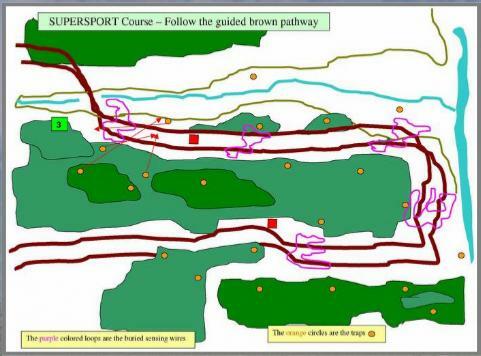 SUPERSPORT used computers and state of the art clay pigeon traps plus radio transmitters and receivers, to simulate a live - walking game hunt. Shooters were fitted with pre-programmed pagers and would walk through a random course, triggering the traps in response to their unique code being transmitted. 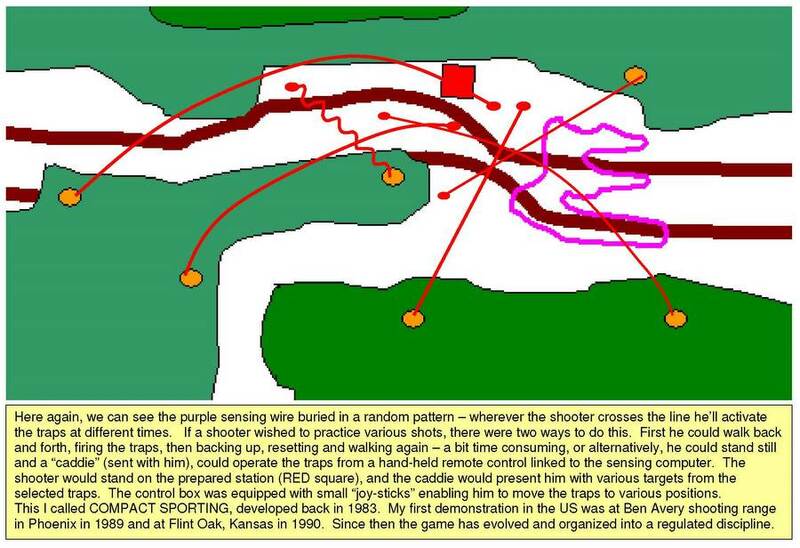 Their requested level of difficulty had been previously set into the controlling computer, and as they approached the traps, the receivers would recognize them and relay their code to the computer. This in turn would adjust the traps to present a variety of easy or hard targets from a selection of traps..